WestLotto is Germany’s largest lottery provider and the control centre for the transnational lottery Eurojackpot including 18 European countries. The company has been in operation for more than 60 years. The 350 employees at the WestLotto headquarters in Münster look after more than 3,300 sales outlets and the internet gaming platform “westlotto.de”. These sales channels offer lottery products such as LOTTO 6aus49, instant lotteries and the Eurojackpot. In 2017, WestLotto processed nearly 187 million game transactions. 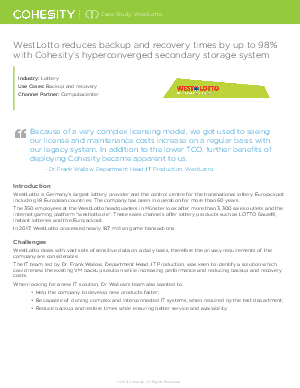 Download this case study to find out how WestLotto reduced backup and recovery times by up to 98% with Cohesity’s hyperconverged secondary storage system.